The project is about taking the context of the word from a book into a 3-dimensional open space and making it dynamic as well. Letting its original meaning, or twisting the meaning completely to allow some playfulness while creating the type. This was done collaboratively between 6 students. They were given the word, and sent in groups to hunt for a suitable space where it could be created. While the other students sat and brainstormed about the visuals that come up, while thinking about the word. • What does the word mean? What are the different contexts in which it is used? • What do you want it to mean? • Depending on that meaning, what space can you think of, to create this word? • Can the space also have something to contribute to the meaning of the word? 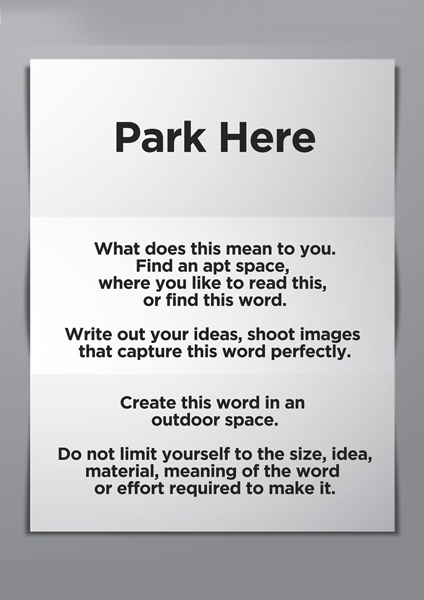 correspond or connect with the word 'Park here'.